March 6, 2018: Airbus is ramping up the messaging for the slow-selling A330neo, reiterating its view that a wave of retirements is coming from current A330 operators that will support new sales. LNC first reported the message Dec. 6. Jeff Knittel, the new president of Airbus Americas, reinforced this message yesterday at an industry conference. As noted in LNC’s December interview with the program chief, Airbus believes the tide on sales will turn with a coming wave of retirements beginning in 2020. 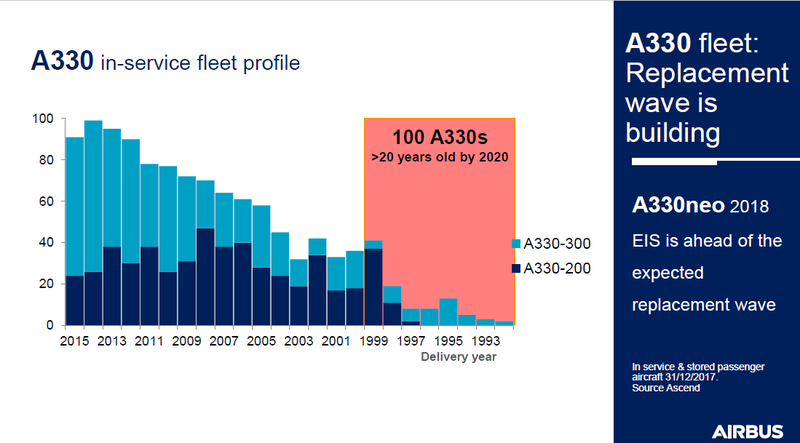 The crux of Airbus’ strategy is that as the A330ceo ages, the current large number of operators will want replacements. The A330neo has close economics to the Boeing 787, for up to $30m less in capital cost. Airbus also sees the growing long-haul, low-cost carrier sector as a natural for the A330neo. But the A330neo was launched long before the Middle of the Market airplane was a gleam in Boeing’s eye. The A330neo has far more range than the prospective Boeing New Midrange Aircraft will have, giving the long-haul advantage to Airbus. But for routes of 4,500nm to 5,000nm, the NMA will have a significant economic advantage over the A330neo, based on LNC’s analysis. If Boeing can keep the price to the airlines in the $70m-range–a tall order, to be sure–Airbus’ sales hopes for the A330neo will be severely tested. Knittel recapped the sales success of the A320neo. 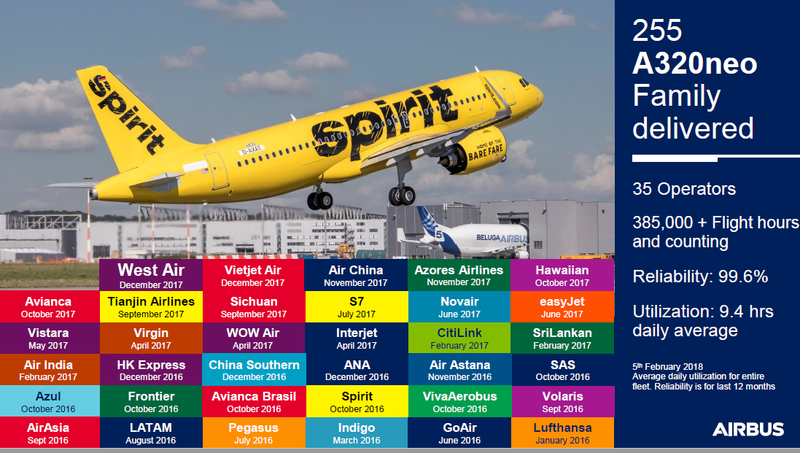 The following illustration is noteworthy with the list of low-cost carriers and its market penetration into what was once an area dominated by Boeing’s 737. Finally, Knittel took a dive into Airbus’ market presence in the US and worldwide. The first transaction was with Eastern Airlines in a deal in which Airbus leased four A300B2s to EAL for six months as a “test drive,” charging $1. The deal led to Eastern eventually ordering 34 A300s. Today, Airbus’ worldwide market penetration is just a tad higher. And note that I got the first comment, there should be a honors list for that! About 100 A330-200 are scrapped or stored. Same for about 50 A330-300. There are still about 200 A300 flying. As mentioned by Randy Tinseth, Boeing won’t build a 767 passenger version again. I think current fuel prices (crude oil during 2014 was around $100, currently around $60) make continued use of the A330 more attractive than was envisioned when the A330NEO was launched. When they do get replaced by airlines I think many A330 will be converted P2F, instead of being parked in the desert. Both the B767 and A330 are great as converted freighers. The A330P2F has not been a big seller. One issue is the sloping floor problem. Boeing flooded the freighter market with very nice deals for 767-300F to keep the 767 line open until the KC-46 was ready. Airbus had no pressure to keep the A330 line open for a tanker aircraft. The slope might have been more of a problem for the A330-200F, which can have heavier floor loads ( as like most original freighter versions has strengthened floor beams) as they did extend the nose gear. But package freighters have lighter pallets and sloping didnt seem to much of an issue for the DC10/MD11 freighters. The sloping floor issue is on the P2F, not on the A330-200F (which has the front gear located in a bulge to correct that). Think the 330NEO’s are much better aircraft than perceived, Boeing has done an excellent covert marketing ops on it. The T7000’s, if a (slight) improvement on the RR-TEN, GE’s, could be key. AB’s “marketing” potentially in question with the 330NEO’s, a more aggressive approach could be required, livery, its better comfort, potential good reliability and so forth. If you do the 330NEO in some of the more bold 350-like presentations it could help to change its image? It looks like there was a lot of noise but no real takeup. Clearly any Airline exec that has A330CEO in the fleet knows what the NEO is, what it can do and if they want it. There are different generations of A330’s. There are a batch of early PWA powered A330’s out of operations and might be good Pax to Cargo conversion candidates. As the A330 range and reliability improved over the years with increased MTOW those are pretty popular. We don’t know yet how effective and productive the A330neo is until TAP get 2-3 years of experience with them. The 797 production costs should creep down as the volume increases and probably Boeing has a scheme that they get less paid per unit as the volume creeps up making their production price getting closer to the A330neo. Airbus should have made a competing widebody FAL in HAM as well, but politically they produce all widebodies in TLS. Surprised with the lack of orders up to now..
Why not, if you have a close look at specs its better than the 788. OEW weight per pax is less than the 788, got better range, comfortable 2-4-2 layout with 18″ seats, later generation engines, etc. …and 95+% commonality with the 339. Some interesting reading re Reuters report/comments on this subject. Whats been ignored as of late in the articles was Air Asia first floated moving up to the A350. That is not off the table and is in Air Asia MO. Why would you compare it to the 787 8..which itself is having paltry sales as of late. .
Should have realized when 330 2 sales stalled,market has definitely changed. I hope they succeed. I like flying them. Quiet, 8 a abreast seating, good for medium range travel. And Boeing needs the competition. 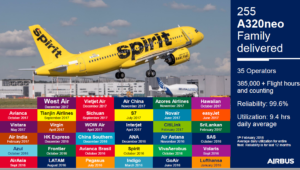 Seeing a minimal change aircraft bar the engines still be remarkably competitive after 20 years is quite a thing in a market that is heavy with new offerings. I don’t see a problem in the A339 picking up good numbers in the longer run. The perverse matter is that with oil price where it is and medium term forecasts for it not much higher (yes I know), the ceo could possibly be a better bet. I think the real concern I would have would be whether the market can keep absorbing circa 45 units a month in total into the future. My less than sophisticated calculation suggests replacements absorbing around 15-20 a month. Is there really an additional demand for the excess, particularly when your B77w or A333 is around 10 years old and you have no massive concern about fuel costs? Why not sweat the assets and save the cash? I’ve been tracking A330 and 787 sales against current airline fleets and don’t share the same sediment as Airbus. You will find most airlines have already played their hand in choosing which aircraft will replace their A330’s. Some have chosen the 787, others the A350 and a small quantity have chosen the A330NEO. For those airlines that haven’t placed orders for new aircraft other factors are at play. For instance one of the oldest fleets (15.1 years) of A330’s is operated by Cathay Dragon. These aircraft are currently being swapped out with relatively new “hand me down” Cathay Pacific A330’s. In turn Cathay Pacific are swapping out the A330 with new A350’s. If we consider the large operators of A330’s they are largely concentrated in China. In most instances these airlines have already ordered the 787, so on face value the A330’s in these fleets reaching retirement age will probably be replaced with 787’s. If we head to Europe IAG have been very public is stating that even though the A330 meets their needs today, in five years time that answer could be very different. With Iberia, Air Lingus and the new Level LCC all being A330 operators, in the near term there is the potential for a relatively large shift away from the aircraft. If this happens the supply and demand equation will be fundamentally altered. We also have to consider current A330 operators who are disposing of the A330’s in their fleets. Singapore Airlines have 24 A330’s that will be replaced with 787-10’s and A350’s over a very short period of time. If we consider this fleet has an average age of 4.1 years, there will be plenty of opportunity for existing A330 operators to swap out their old A330’s with relatively new A330’s and at a reduced price. In the A330/787 my numbers suggest 45 operators to be dedicated to the A330 (this could change with a 787 IAG order), 47 to the 787 and 22 to a mixed fleet of A330/787. If we look at the quality of the customer base the A330 has a ranking of 0.97, the 787 1.0 and the mixed A330/787 fleet 1.32. As such, strategically there will be a lot of value in receiving an order from a customer who currently operates a mixed fleet. I saw that point too. Many airlines already choose their replacement, and 1300 B787 orders as 850 A350 orders and 200 A330neo orders should serve that market. There’s a major IAG order pending, and AirFranceKLM didn’t choose their B772 and A330 replacement. They might go larger for A35k or B777x instead of A330neo vs. B787. Delta and United are potential customers. And maybe some growth, but actually I see the market needs are well fulfilled and the order boom has already been made. If AB doesn’t have a new ~250 seat aircraft (2-4-2) with ~5000Nm range in place by around 2028 they will lose the bulk of the A330 replacements to the 787 and 797’s. An 280 seat 350-800 may soften the blow for 330CEO operators that want more range. Still wondering if there is not merit in an A330NCW (Neo’s Wing and Cabin) with Current Engines. This could be of interest to airlines that currently operates 330’s with GE or P&W engines. Coming in at a good price operators of large fleets of 330CEO’s (China for example), LCC’s and those mostly operating shorter (<4000Nm) routes where belly revenue is important may find these upgrades are all they need? Airlines did show interest in an 767 "Revive", with the 330 the wing and cabin improvements are already in place such an aircraft could get unexpected interest? Boeing loves to use the term opening new routes, 787 now 797. But was there ever and ~250 seat aircraft that could fly 8000+Nm routes? The 330-800 (248-251T MTOW?) could actually open new long thin routes that’s not even achievable by the 789 and also have the capability to operate on shorter haul routes at lower sector costs than the 789? Sector cost is a fact, seat mile cost is relative to your load factor. Point taken but think these two aircraft are in very different categories, 250 vs 300 seats, 72Klb vs 115Klb thrust, MTOW 250 vs 350T. See there could be more action coming on the wide aisle front. Thai, JAL, LH talking about more 350’s, etc. (AA, IAG, UAL “old news”). Surprised that since 1985 the number or daily passengers in Airbus aircraft has only risen by factor of 6. I would have expected more. The A330Neo has not been wiped off the map by the Hawaian cancellation : Indigo plans to order up to 50 A330. An 330-800 could definitely have a niche of opening new long thin routes where the 789 might be short of range and/or to big and an 359 to big. Turkish and Qatar have sizeable 330 fleets, an 338 could serve destinations to South America and Australia that was not previously in reach or current aircraft with the required range to high capacity.